In November of 2009, I took a trip to the Mexico/U.S. border with Rev. Louise Green and other members of All Souls Church, Unitarian in DC. The organization that led our trip was Borderlinks. Being so close to the border in Tucson is a very different experience than thinking about immigration here in DC. The effects of our immigration policies are immediately evident there. So when I read the following account of last week’s ICE (Immigration and Customs Enforcement) raids by Borderlinks staffer, Rachel Winch, I knew it had to be shared. With her permission, Rachel’s description of April 15th, 2010. “ICE has swarmed the city. There are over 800 officers making check points and raids all over South Tucson.” I felt a sense of panic as a friend from Derechos Humanos, a grassroots organization that promotes human rights and fights the militarization of the Southern Border, came to share the news this morning that Immigration and Customs Enforcement (ICE) had taken hold of South Tucson. For those living in parts of Tucson besides South Tucson, the largely Latino/a “Pueblo Within a City,” it would be easy not to know that anything out of the ordinary was happening today. It is even possible that those passing through the area who were not worried about their immigration status or being “confused for a migrant” could pass by the 12 patrol vehicles and Drug Enforcement Administration (DEA) officers in full black facemasks at the intersection of 6th Avenue and 29th Street without being filled with fear. But for members of the Latino/a community and anyone who might “appear to be here illegally” (i.e. have brown skin), today was no less than terrorization. Two teenage boys pulled off a bus on their way to school and taken into custody. Armed enforcement officials patrolling within eyesight of students playing at a local elementary school. Fathers, brothers, sisters, mothers, pulled over at “random” checkpoints and leaving in handcuffs when they failed to produce documentation. A Latina college student at the University of Arizona carrying three forms of ID with her in fear that she would be interrogated. April 15th, 2010, South Tucson has become yet another example of the ever increasing police state. For those of you outside of Arizona, this may seem unfathomable, an exaggeration even. Surely this could not be legal to stop people simply walking down the street or driving their cars around town because they “look like they might be undocumented.” In the Land of the Free people do not need to walk around carrying documentation, right? Well, that may be called into question this week in Arizona after the state house of representatives passed landmark legislation that would greatly extend the powers of police and immigration officials. Under the new legislation, police would have the right to ask anyone whom they have “reasonable suspicion” to believe is in the country illegally to produce documentation proving their legality. Whereas formerly police were only allowed to ask for such documentation if a person were arrested for another crime, under the new legislation standing on a street corner and looking Latino, or looking for work at a day labor center would be probable cause for police to interrogate and make an arrest if such papers were not produced. While under the guise of attempting to crack down on human smuggling, today’s checkpoints and the interrogation and arrest of people without evidence of involvement in smuggling is yet another example of the Department of Homeland Security’s increased terrorization of the Latino/a population and militarization of the US-Mexico border. Friends, we must take action to ensure that these raids stop and that police and immigration officials are not allowed free range of our communities. We must not stay silent as our brothers and sisters are being intimidated, arrested, deported. Please join me in writing to your local newspaper, contacting your elected officials, and telling your friends. Not in our name. 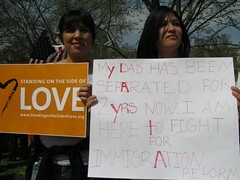 These were some of the stories shared at the Derechos Humanos rally outside the Federal Court building at 2:30 pm. April 15, 2010. 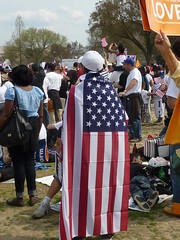 On Sunday, March 21st (the first day of Spring), several of us were blessed to be able to participate in a massive rally in favor of comprehensive immigration reform. Organizers estimate the crowd at over 200,000 attendees. From our vantage point, it was clearly crowded, festive, diverse, family-oriented, and filled with love. As the singing of the Star Spangled Banner came to an end, I wondered how the words “land of the free and home of the brave” felt to the many immigrants in attendance. I suspect that they appreciate what freedom means more than I ever will. As brave as I like to think I am, I don’t know if I’d have the courage to move to a foreign country–leaving behind everything familiar and potentially risking everything–in order to provide for my family. Hopefully I will never be faced with that choice. I was moved by the number of families who attended the rally with their children, and by how many of those families have been negatively affected by current immigration policies. I was encouraged by the many religious groups represented, including Unitarian Universalists. It was heartening to see that the message of Standing on the Side of Love resonated with so many non-UUs, especially when children, youth and young adults asked for the SSL buttons, placards, and bumper stickers. The moment that reduced me to tears was when, strolling along, I saw this young woman holding her handwritten poster. 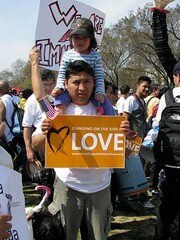 On either side of her stood friends, holding “Standing on the Side of Love” placards. (I couldn’t fit all three of them in and still read what she had written.) I saw how love was, literally, allowing her to stand. We’re always talking about ‘deadbeat dads’–here’s a deadbeat system forcing parents away from their kids. It broke my heart. 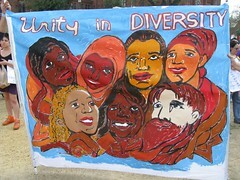 As a person of Asian descent, I am very aware that different ethnic minorities in the U.S. have often been pitted against each other, when we could be so much stronger united. And I know that undocumented immigration is also an Asian issue, even though Latinos/Hispanics get most of the (unpleasant) attention. So it was very important to me to see diversity represented both on stage and in the crowd. While most of the people present appeared to be descended from Latin America, there were also Asian, African and Euro faces speaking as one. Walking among the crowd, I felt we were united, strong. This IS America.